WOMAN IN WHITE IS HERE! I am deeply pleased and hugely relieved to announce that my second album "Woman In White" is now available. It's still making its way to CDBaby.com, Amazon, and various lucky record stores around the country, and it is also currently being distributed to iTunes and all the other major digital music stores. So for now, the only way to get a copy is to buy it from me direct ($10 shipped), or if you are in the Boise area, from bassist Bob Umphress who has a carton of them in his rehearsal studio. Email davidmacneillmusic [at] gmail [dot] com for more info. Into each life a little rain must fall. We hit a manufacturing delay that has pushed back release for roughly two weeks. Couldn't be helped. The new CD is shipping from manufacturing October 3 so I should have them by the 8th. They also ship to CDBaby.com and go to iTunes, Amazon, and all the other major digital stores. HELL YEAH! My new album "Woman In White" is off to manufacturing, to be followed by availability at CDBaby.com, iTunes, Amazon, and select record stores around the US. I'll post here when it's available for physical and digital purchase. What a long strange trip it's been. Mixing of "Woman In White" is finally done and has been delivered to legendary Jon Raney of Raney Recording Studio for mastering. It's been a long process but the result is worth it! The website has been in mothballs for over a year while I tried to make Facebook my only portal. But as many of my fellow artists have learned, social media is no substitute for having your own website, and so we're back! The band is firing on all cylinders! With Bob Umphress on bass, Chris Murray on guitar, and John Knox behind the drums, the songs have never sounded better. Last week, after a particularly wonderful rehearsal session, Bob suggested that is was time to record the second album. Everyone agreed: the music is ready! We have been invited to play two sets on Songwriter Club night at The Bouquet in Boise on Sunday April 25 at 8, no cover. This will be the public debut of our new lineup with Chris Murray and John Knox, so join us for an ale. We guarantee you will leave the place humming a new tune. I am overjoyed to announce the addition of ace guitarist Chris Murray and "drummist" John Knox to the "MacBand", as we informally call this cowboy outfit. The songs have never sounded better and I can honestly say that I have never had more fun in any band. The first public appearance of the new David MacNeill Band will be on the riverside deck of Bardenay in Eagle. Click on the Calendar button for more info. ABC News has posted the 6+ minute video of the news story they filmed last week, featuring my music as the soundtrack. The segment, which aired Wednesday evening, tells the story of my family moving into a 33-foot motorhome. Enjoy! ABC News came out to visit and filmed me playing Morningtown for an upcoming Nightline segment. Fortunately I was in good voice and my Scott McNeill-built guitar sounded particularly sonorous that afternoon. I'll post the air date and time here as soon as I know it. NEW FRIENDS, NEW ENERGY, NEW POSSIBILITIES! I'm back home from my wild week in Nashvegas. Played in the round at the Bluebird Cafe, on a huge stage at Cadillac Ranch, and in the corner at historic Brown's Diner. Met some of the greatest songwriters on Earth and came back more inspired than I've ever felt in my life about what I do. New friends, new energy, new possibilities! LET THE SUMMER UK TOUR BEGIN! I'll be flying to Austin to meet up with partner Bob Cheevers on June 22, and from there we're off to London to begin our 9-week tour of England and Scotland. We've got 42 gigs booked from one end of the sceptered isle to the other, along with songwriting workshops and radio interviews, so we're going to be busy boys. "Fiona's World", the CD Bob and I wrote and produced together early this year has been released to rave reviews and is at the top of the charts. I'll be opening most shows to support my CD "Morningtown", so between us we have a lot of new material to play for you all. I'll list all my gigs on my page before I go. Hope I see all my UK friends there and get to make loads of new ones too. 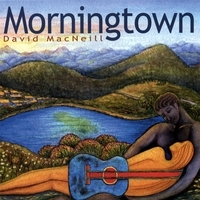 Click to see Morningtown at the iTunes Store. David MacNeill's first solo CD is made up of eleven of the writer's favorite songs written from 1997 to 2007. Over the rock-solid foundation of Jerry White's powerful bass lines and Buzz Baker's sophisticated percussion, David layers a shimmering array of acoustic, electric, resonator, and baritone guitars in addition to singing all vocal leads and harmonies. Studio ace Lance Taber played soulful electric guitar, Ray Elzey delivered brilliant pedal steel, and former Nashville producer Cory Fite contributed tasty keyboards and rich orchestral strings. Within the album's inviting arrangements, moving vocals, and strong instrumental performances, the heart of this record is the song. Though composed and delivered in a very personal manner, the lyrics reflect common experiences and simple truths that resonate with everyone.